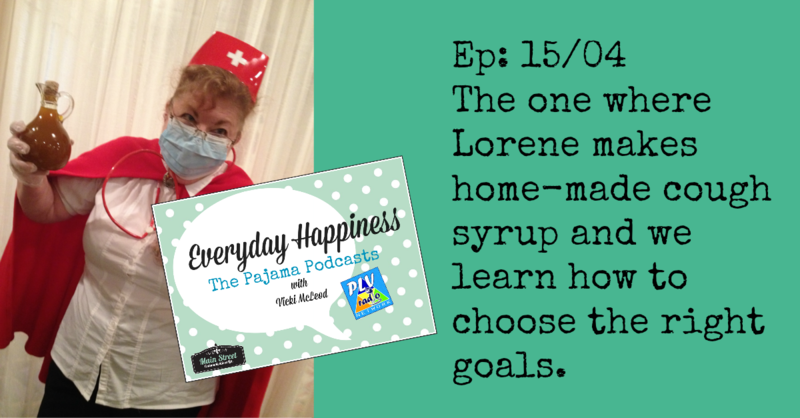 The one where Lorene makes home-made cough syrup and we learn how to string happiness along, one bead at a time. We continue the conversation we started last week about setting mindful and meaningful goals and we explore how to take purposeful action without creating massive disruption in your day-to-day life. It’s really important to build your future vision on today’s solid foundation. There may be areas of your life or business that require radical change, but not if it means sacrificing an area that’s really working well. Choosing the right kind of goal makes all the difference. So how to decide? We cover that , too. Meantime, we’ll take a short meander down the side road of cold and flu season and offer up a resource for a natural cough remedy. Very useful for us newbie podcasters, as well as multipreneurs in general. One thing you know running your own business is that when you go down the business can grind to a standstill. Let’s keep self-care top of mind. Put on your pajamas, grab a mug of ginger tea, and have a listen . Note: Yes, there is a humming sound in the second segment of this episode. We tracked it down and we’ll fix that. I have a funny little auto-fan in the office. It popped on, and I didn’t really notice. I’m blaming it on the cold. *sniffle* We are perfectly imperfect. A special thank you to Greg Stuart of Grene Genes Productions for tech support. The beautiful wrap music is ‘Before and Again’ composed and recorded by GJR Stuart at Grene Genes Productions, Maple Ridge BC. What kind of goals are right for you in 2015? We’d love to hear about them.